In the past two years the interest rate in India was following downward trend. The downward trend accelerated after demonetization as banks became flushed with cash. However, you might have been hearing headlines about increase in deposit interest rates by some major banks like SBI, Axis, HDFC bank in the last 2-3 months. Some banks have increased the interest rate on fixed deposits by more than 1% in last 2 to 3 months. Though not much in media but most loan rates have also gone up or are scheduled to be revised upwards from this month onward. As you can see increasing interest rates are good news for savers while its bad news for borrowers. 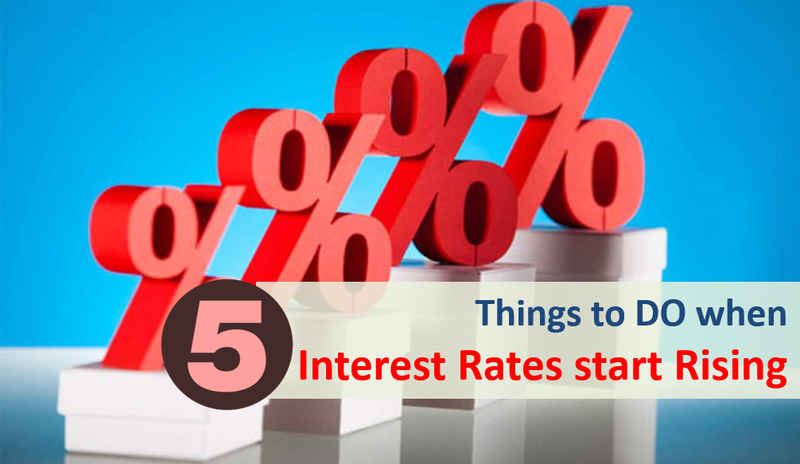 In this post we cover 5 things which you should do when the interest rate cycle turns upwards. As stated the interest rates on loans have started going upwards. This either increases your EMI or tenure (in case the EMI is fixed). Its good idea to either aggressively pre-pay some part or settle the loan sooner. This is truer for loans that have been taken recently as the interest outgo is much higher in the starting period. If you check the table below, For Rs 50 Lakhs loan at 8.5% and 20 years duration the EMI is Rs 43,391. In the first year 81% of payment just goes to service interest. If you had invested in fixed deposits in last 2 years the interest rate would be lower. Do evaluate if it makes sense to break them and re-invest. Do keep in mind the penalty and lower interest you may earn in case you break your FD prematurely. Premature withdrawal may not make sense right now as interest rates are expected to rise further but do keep an eye. We believe the interest rates should rise further in coming months and hence it might not be good idea to still lock your money in long term fixed deposit. Keep your money in fixed deposit with 6 to 18 months tenure as when they mature you may likely get higher interest rates. Also expectation is you may get higher rates in Small Saving Schemes like SCSS, NSC or KVP in next few quarters. The best time to open recurring deposit is when the interest rates are higher. You can lock-in high interest rate even without investing money in one go. Do wait for some more time and open a long term recurring deposit account. Most banks allow RD up to 10 years tenure. Right now, choose a shorter tenure as stated above. Debt mutual funds can be classified based on the maturity of debt instruments they invest. Liquid or short duration funds invest in instruments maturing in 90 days to 2 years while long term debt funds invest in bonds maturing in 15 to 30 years or even beyond. As the interest rates start rising the long-term bonds price comes down. Going forward you may get lower returns from long term debt funds and may even get negative if there is sudden spike in interest rates. So, its good time to exit and invest in short term debt funds. Also Read:How SWP in Debt Funds is better than FD for Regular Income? The interest rate cycle is difficult to predict but it seems that its going to go up in coming months. Do keep eye on it and time the same with opening long term recurring deposits and converting your low yielding FDs to higher ones.